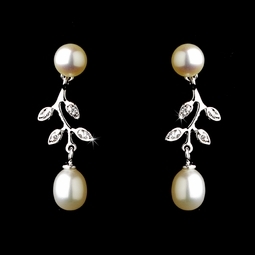 Description: Elegant earrings featuring genuine cubic zirconia crystals in a silver-plated setting with two timeless light ivory freshwater pearls on each earring. A subtle accessory which will add a lovely and delicate accent to any elegant ensemble. Size: 1 1/4" long .